Michael Jackson's death has been ruled a homicide caused by a mix of drugs meant to treat insomnia, a law enforcement official told The Associated Press, while his personal doctor told investigators he was actually trying to wean the King of Pop off the powerful anesthetic that did him in. Forensic tests found the anesthetic propofol combined with at least two sedatives to kill Jackson, according to the official, who spoke Monday on condition of anonymity because the findings have not been publicly released. Based on those tests, the Los Angeles County Coroner has ruled the death a homicide, the official said. The coroner's homicide ruling does not necessarily mean a crime was committed. But it makes it more likely criminal charges will be filed against Dr. Conrad Murray, the Las Vegas cardiologist who was caring for the pop star when he died June 25 in a rented Los Angeles mansion. The coroner's finding "doesn't mean we are going to see a homicide, as opposed to manslaughter case against anyone," said CBS News legal analyst Andrew Cohen. "The examiner's office doesn't distinguish between legal terms 'manslaughter' and 'homicide.'" Through his lawyer, Murray has said he administered nothing that "should have" killed Jackson. Murray told investigators that Jackson stopped breathing about 10 minutes after he relented and finally gave in to his patient's demands for propofol around 10:40 a.m., following a nightlong regimen of sedatives that did not work, according to court documents unsealed Monday. A search warrant affidavit unsealed in Houston, where Los Angeles police took materials from one of Murray's clinics last month as part of their manslaughter investigation, includes a detailed account of what detectives say Murray told them. Manslaughter is homicide without malice or premeditation. The doctor said he'd been treating Jackson for insomnia for about six weeks with 50 milligrams of propofol every night via an intravenous drip, the affidavit said. Murray said he feared Jackson was becoming addicted to the anesthetic, which is supposed to be used only in hospitals and other advanced medical settings, so he had lowered the dose to 25 milligrams and added the sedatives lorazepam and midazolam. That combination had succeeded in helping Jackson sleep two days prior to his death. So the next day, Murray told detectives, he cut off the propofol  and Jackson fell asleep with just the two sedatives. Murray told detectives that around 10:40 a.m. he gave in to Jackson's "repeated demands/requests" for propofol, which the singer called his "milk," according to the affidavit. He administered 25 milligrams of the white-colored liquid  a relatively small dose  and finally, Jackson fell asleep. Murray remained with the sedated Jackson for about 10 minutes, then left for the bathroom, the affidavit said. Less than two minutes later, Murray returned  and found Jackson had stopped breathing. Cell phone records show three separate calls from Murray's phone for between 11:18 a.m. and 12:05 p.m., the affidavit said. It's not clear who received the calls. Murray had told authorities he was administering CPR during that time. In a statement posted late Monday on his firm's Web site, Murray's attorney Edward Chernoff questioned the timeline as depicted in the affidavit, calling it "police theory." 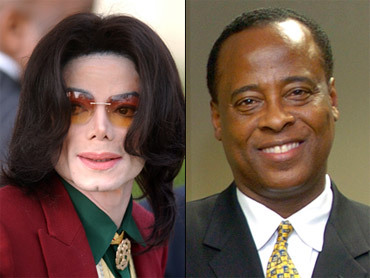 "Dr. Murray simply never told investigators that he found Michael Jackson at 11:00 am not breathing," Chernoff said. He declined to comment on the homicide ruling, saying "We will be happy to address the Coroner's report when it is officially released." It is no surprise that such a combination of medications could kill someone, said Dr. David Zvara, anesthesia chairman at the University of North Carolina at Chapel Hill. "All those drugs act in synergy with each other," Zvara said. Adding propofol on top of the other sedatives could have "tipped the balance" by depressing Jackson's breathing and ultimately stopping his heart. The 25 milligrams of propofol "is not a whopping amount," said Lee Cantrell, director of the San Diego division of the California Poison Control System. It was the cocktail of the other sedatives, known as benzodiazepines, that "may have been the trigger that pushed him over the edge," Cantrell said. CBS News analyst Trent Copeland told CBS Evening News anchor Katie Couric that he is surprised Murray has yet to be charged. "It's actually surprising that those charges have not yet been filed," he said. "Particularly, given all the evidence that appears to be mounting against the doctor. There's documentary evidence, there's evidence from statements he provided to law enforcement in those six hours plus interviews. I'm a little surprised that we have not yet seen charges filed against the doctor, or him arrested. But… I expect that to happen very, very soon." The affidavit, signed by a judge July 20, said that the coroner's office chief medical examiner told police his review of preliminary toxicology results showed "lethal levels of propofol." Murray didn't tell paramedics or doctors at UCLA hospital where Jackson was rushed about any drugs he administered other than lorazepam and flumazenil, according to the affidavit. It was only during a subsequent interview with Los Angeles Police detectives that Murray gave a more full accounting of the events leading up to the 911 call, the document said. The coroner's office has not publicly released its autopsy findings, citing a request from police to withhold results until their investigation is complete. A call to the coroner's office was not returned Monday. A spokeswoman for the Los Angeles District Attorney's said no case had been presented so the office had nothing to comment on. The line between safe and dangerous doses of propofol is thin, and according to the drug's guidelines a trained professional must always stay bedside. Word that Jackson was given the drug to help him sleep startled the medical community, not the least because the setting was his rented mansion. Home use of propofol is virtually unheard of  safe administration requires both a specially trained anesthesiologist and an array of lifesaving equipment. Murray was trained as a heart doctor, not a pain and sedation specialist. At Jackson's bedside were pill bottles for other drugs prescribed by Murray and two other doctors, the document says. The medicines include a variety of anti-insomnia drugs, a muscle relaxant and a drug for urinary problems from an enlarged prostate. Investigators found about eight bottles of propofol in Jackson's home along with numerous other medications, according to the affidavit. Murray told investigators he didn't order or buy any propofol, but investigators served a search warrant Aug. 11 at a Las Vegas pharmacy and uncovered evidence showing Murray legally purchased from the store the propofol he gave Jackson the day he died. • "I have reason to believe and do believe that evidence of the crime of manslaughter" was found in Murray's storage facility. • Murray says he administered "several drugs to Jackson in the early morning hours" and at 11am, Jackson stopped breathing. • "toxicology analysis showed that MJ had lethal levels of Propofol in his blood"
• On June 23 gave him lorazepam and midazolam. • 0130am - valium pill. • Jackson remained awake and at 0730 Murray gave him more midazolam in IV. • Jackson remained awake and at 1040am Murray gave him propofol diluted with lidocaine via IV drip. Jackson finally went to sleep.